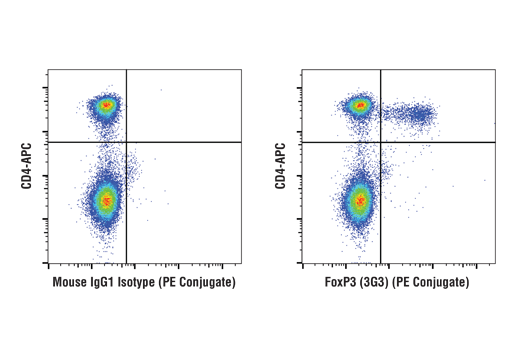 Flow cytometric analysis of mouse splenocytes fixed and permeabilized with #43481 FoxP3/Transcription Factor Fixation/Permeabilization kit, using FoxP3 (3G3) Mouse mAb (PE Conjugate) #49402 (right) and co-stained with CD4-APC #78292, compared to a concentration-matched Mouse (MOPC-21) mAb IgG1 Isotype Control (PE Conjugate) #63630 (left). FoxP3/Transcription Factor Permeabilization Buffer (10X) (#68751): Dilute desired amount to a 1X working solution with reverse osmosis deionized (RODI) or equivalent grade water. Use for all wash steps and antibody incubation following fixation. Cellular dyes (e.g., live-dead discrimination, DNA dyes, etc. ), optional. Visit www.cellsignal.com/flowdyes for a full listing of flow cytometry validated cellular dyes. NOTE: Fixable viability dyes such as Ghost Dye™ Violet 510 Viability Dye #59863 should be added prior to fixation, following the dye product recommended protocol. Proceed with fixation once excess dye has been removed. NOTE: Add antibodies targeting CD markers or other extracellular epitopes prior to fixation. The antibodies will remain bound to the target of interest during the fixation process. A wash step prior to fixation may be performed but is not necessary. Pellet cells by centrifugation and aspirate supernatant. Resuspend cells in 1 mL FoxP3/Transcription Factor Fixation/Permeabilization 1X working solution, prepared as described above. Mix well to dissociate pellet and prevent cross-linking of individual cells. Incubate 30-60 min at room temperature (20-25 ºC). Protect from light. Wash cells 2 times in excess 1X FoxP3/Transcription Factor Permeabilization Buffer. Resuspend cells in 100 µl of diluted antibody, prepared in 1X FoxP3/Transcription Factor Permeabilization Buffer at the recommended dilutions. See individual antibody datasheets or product webpage for recommended dilution, or determine via titration. Incubate for 1 hr at room temperature (20-25 °C). Protect from light. Wash by centrifugation in excess 1X FoxP3/Transcription Factor Permeabilization Buffer. Discard supernatant. Repeat. If using a fluorochrome-conjugated primary antibody, resuspend cells in 500 µl 1X FoxP3/Transcription Factor Permeabilization Buffer and analyze on flow cytometer; for unconjugated primary antibodies, proceed to next step. Resuspend cells in fluorochrome-conjugated secondary antibody, diluted in 1X FoxP3/Transcription Factor Permeabilization Buffer at the recommended dilution. Incubate for 30 min at room temperature (20-25 °C). Protect from light. Resuspend cells in 500 µl 1X FoxP3/Transcription Factor Permeabilization Buffer and analyze on flow cytometer. Store at 4ºC. All components in this kit are stable for at least 6 months when stored at 4ºC.